We live in an age of hype and marketing. Not to mention law firms that keep ‘name-dropping’ novelty-sounding things they have no technical grasp of. “OIN seems to believe that the solution is to hoard yet more such patents, but in reality the goal should be to void them all.”Many of today’s patents disguise themselves as “blockchain”, but actually they’re software patents that should be seen as patent-ineligible. OIN seems to believe that the solution is to hoard yet more such patents, but in reality the goal should be to void them all. It might be enough to petition PTAB a few times to informally invalidate — by extension — many similar patents (in the same domain). A wide array of corporations, including Alphabet Inc.’s Google and Bank of America, are lining up to enter a potentially lucrative club: one that allows them to own patents on blockchain technology. But getting past the patent office’s velvet rope won’t be easy. Blockchain inventions — from digital currencies to super-fast, secure trading systems — often cover software and financial service-related technologies. The U.S. Patent and Trademark Office has a track record of leaving applicants out in the cold if they seek patents for presenting other types of software or financial services inventions that are too abstract or obvious. Blockchain tech might be poised to revolutionize how companies like Bank of America operate and cryptocurrencies like Bitcoin trade. 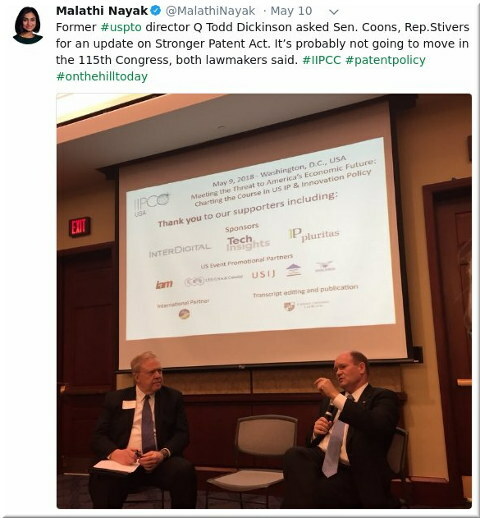 But inventors trying to patent their ideas in the field—and stake their claim on future profits—are facing hurdles at the U.S. Patent and Trademark Office (PTO). “Though there’s been a surge of these patent applications, winning or scoring these patents on these technologies won’t be easy,” Bloomberg Law reporter Malathi Nayak said in a recent podcast episode of Code & Conduit. Bloomberg Law data shows a wave of new applications have hit the patent office in recent months, but only a fraction have won patents. This is basically more from the same person, Nayak. When they say “software inventions” they mean software patents, i.e. something which is being phased out. “…patent quality is being improved, the bar is being raised by the courts (more so than by the granting authority, USPTO).”As we’ll show and discuss this coming weekend, software patents are as weak as they can be in the US. It’s getting worse for them over time. That’s because patent quality is being improved, the bar is being raised by the courts (more so than by the granting authority, USPTO).